Just like other people and things that you love, you have to treat your car right if you want it to perform at its best. Sometimes people have a car they rarely drive, but keep it because they need it occasionally, it holds special memories, it’s a classic or antique, or sometimes they just love the vehicle too much to part with. Residents of Redlands, CA who have cars that aren’t going to be used for an extended period should not let them sit idle in the driveway waiting for damage from weather, dirt, debris, or theft. They should be stored in a safe location, away from the elements, where you can access them when you need them. 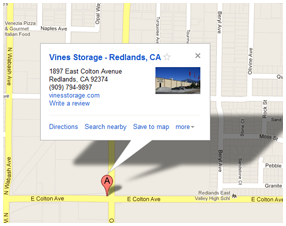 Vines Storage Facility in Redlands, CA offers its customers open space storage or self-storage in their spacious and climate-controlled area. Here are some other things to consider when putting your car into storage. Location – Choosing a location that is dry and dark reduces the risk of rust, corrosion, or fading from the sun. Additionally, by choosing an indoor location, you can help prevent bugs or rodents from getting into the inside of the car, the engine, or the HVAC system. Car enthusiasts recommend setting the air conditioning to the “recirculate” option, which will close the ventilation system and keep pests from getting into the car. You can take it a step further by closing off the air intake and tail pipes. This also helps keep moist air out of the car. Moist air is the cause of most corrosion. Clean your car – It’s important not to overlook this detail of car storage. The condition of your car going into storage will be a big factor in the condition of your car coming out of storage. Clean both the interior and exterior of the car well – vacuum, wipe down the interior, wash and wax the exterior, and be sure to do it all thoroughly. Maintenance – When you’re ready to drive your car, you want it to start. Therefore, it’s best to get it checked out before you park it. Whether you’re mechanical or you need to get some help, have the fuel systems, gas tank, battery, engine, brakes, and tires checked out to ensure that there are no small problems beginning.